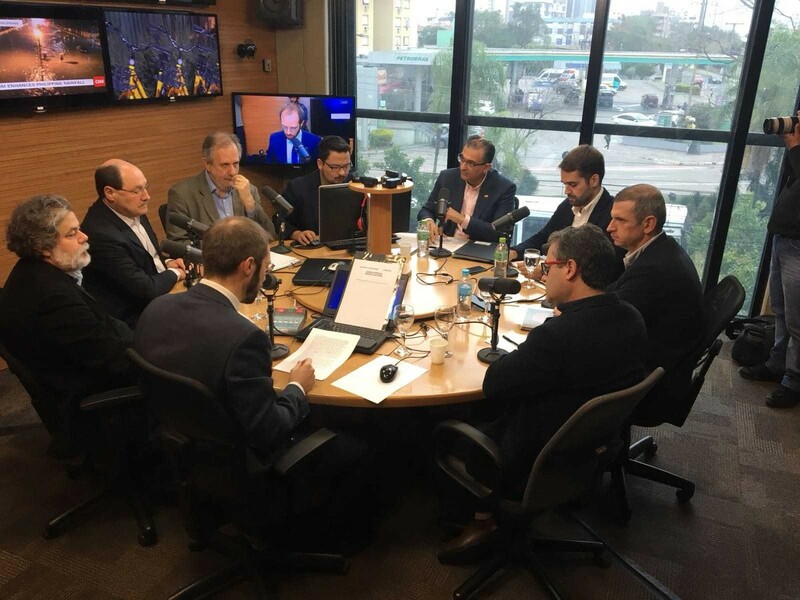 The panel was attended by Eduardo Leite (PSDB), Jairo Jorge (PDT), José Ivo Sartori (MDB), Julio Flores (PSTU), Mateus Bandeir (Novo), Miguel Rossetto (PT) and Roberto Robain (PSOL). In the first block, each candidate had two minutes to play. Then the mediator asked the question for each competitor who took 1 min30 for the answer. The questions were elaborated and produced live. The candidate's lecture and response to the questions was drawn up before the discussion. In the second block, questions are placed among the candidates, with a free theme. The order of who would be looking for a set is a series. Each candidate asked the question and gave an answer. The candidate was 30 years old to ask a question; the candidate who chose to answer had 1 min30 for the answer; the candidate he asked had 1 min for the answer and the candidate who answered, 30s for the answer. In the third block, the candidates commented on the topics proposed by listeners via Twitter and WhatsApp. According to the order in advance, each competitor had 1 min30 to address one of the topics. At that time the mediator asked the question produced by the production of the program. Each participant had 1 min30s to answer. Among the most commonly covered topics were security and taxes. The first responder was the candidate of PT, Miguel Rossetto, who proposed replacing and increasing the police force with work directed at prevention. "We will return the Military Brigade to the neighborhood community police, supporting and protecting the population. I want civilian police to have more and more capability of investigation, preventive police," he said, speaking about the need to protect students in schools. Eduardo Leite of the PSDB was the second speaker on the same subject, emphasizing the involvement of civilian police delegates in his panel and the need to secure the replacement of police forces for which he says he faces a lack of appointment, "You can not afford to open a giant money gap, "he said. He also talked about the need to invest in the penitentiary, with the participation of the private sector. Matheus Bandeira, Novo, defended the end of something defined as "bandidolatria" which, according to him, is the blame of the victim and not the punishment of criminals. "The rogue must be afraid of being caught by the police, being in jail, for a long time to remain in prison," he said. According to the candidates, it would be possible to invest in police, prisons, and judicial posts, with adjustments to reduce the rapid pace of police retirements. Jairo Jorge from PDT also talked about strengthening the number of police officers in the state. "We need to have surveillance systems in each state region, we must progressively expand efficiency." The candidate added that security is a matter to be solved by the governor without being delegated to the deputy or secretary. "I did this as a mayor, though many mayors did not raise that thing, I asked for solutions." Recruitment of police officers was also highlighted by PSOL's Roberto Robain, who also defended the change of attitude in dealing with the crime. "Considering that public policy is reduced to repression is a big mistake. Share the idea of ​​reducing the welfare state and simply increasing police and criminal status." He added the need for national security policy, anti-drug revision, and focus on combating life-threatening crimes such as robberies and feminicides. Present Governor José Ivo Sartori (MDB), in search of a re-election, began his speech, saying the security issue was a priority and made the budget increase for 2017. The candidate said that adjustments to security servers were paid, and reminded of public tenders. "We have now made a bid for 6.100. It's never been made in this book in the Rio Grande do Sul State," he said, quoting the partnership for building a prison. PSTU candidate, Julio Flores, spoke last in this block on that topic. "We want to dismantle the drug trade, and that is why we do the following: decriminalize drugs, not necessarily Uruguayan model, but we have to have another model," he suggests. It also raised the need to address the problem of users as a public health problem. Still in the same block, candidates are questioned whether they will increase the ICMS rate, which expires at the end of the year, or if it will abandon that collection, which represents about $ 2 billion a year for the state treasury. In January 2015, the Government could approve in the Legislative Assembly an increase in ICMS rates from 17% to 18% for operations and services provided at a certain rate. Electricity, alcohol, gasoline and fixed and mobile telephones have risen from 25% to 30%. New candidate Matheus Bandeira said he would not increase tax by adopting fiscal savings and privatization. It also called "fiscal irresponsibility of different governments" as the cause of the problem. "If the rate increase is not maintained, I will not propose a label," he said, adding that he would propose a gradual reduction of taxes over the next four years. Governor Sartori said that the proposal is not an increase in taxes, but maintenance of what has already been practiced, with the risk of non-execution of salaries of civil servants. He criticized the dissolution in the Assembly of Proposals aimed at distributing the Executive, Judiciary and Legislation of Impact on Collection, Twelfth. "The crisis is not only enforceable, the crisis is not only a national, economic recession brings results for everyone, everyone has a belief, but no one is a solution." The third answer to the topic was Jairo Jorge. He remembered working on the topic at City Hall Canoas. "I propose the trigger law, I did it when I was the mayor, I created the first Brazilian law, that when you increase the actual collection, it triggers a trigger and reduces the rate next year," he said. Roberto Robain said he would not be devoted to a linear increase in taxes, but to collections of those who have the economic power to "help finance the state". "We have the ability to suspend payment of debt, with more than $ 3 billion in resources. According to the law, there are 4 billion euros in the cannabis, with R $ 8 billion in tax evasion, tax exemption. " Júlio Flores presented a proposal in the same line, saying that the state guarantees a rich and powerful" binge ". "It's public money that could be in the treasury, but it's in the service of big money," he said for tax relief. Speaking of this issue, Eduardo Leite defended progress in combating costs by adopting structural reforms. "The increase in tax rates that has been made, it must be associated with this reduction in costs, this is done anywhere in the world." Amongst the measures, Leite stressed the need for privatization "for a new development project, not paying for funds". Miguel Rossetto began his speech saying the situation was "very serious". "Maintaining these rates will be linked to the policy of reducing, and more than, the policies of protecting our economy and our industry," he said. He added that he would fight against the privileges, such as paying housing assistance to the servers. The fourth block was the finite candidate considerations, with 2 minutes for each. The final considerations, the order of the candidate's words, Gaúchosa and gaúcha, I will only propose in this campaign what I know I can do because I have already worked and it has worked. I was honored to be the best rated mayor of Rio Grande do Sul, in research that I did not, but the paper runs the dpovo, institute method. Among the largest cities in Rio Grande do Sul, I received, at the end of my government, 77.8% Canoans. In eight years, with less bureaucracy and less taxes, I tripled my collection of my city. Under my teachers is R $ 4,214.34, the second best floor in Rio Grande do Sul. I killed the murder by 17.5%, while Rio Grande do Sul in the same period between 2009 and 2016 increased by 60%. I built 5 UPAs, Canoas is a city with more UPAs in Rio Grande to Sulu, I ended up with rows at the stations. I want a chance at these elections. I'll have a minute on television. I am among the candidates one of those who have less time on television. I want the opportunity to deepen in the second round, ideas, suggestions, look for innovative solutions for Rio Grande, because that's the way. I did not throw stones at anyone. I traveled through the Rio Grande for 17 months, talked to more than 28,000 gauchos, traveled over 100,000 kilometers, visited 497 cities. I understand that it is necessary to unite. You do not need to throw stones away from using rocks to build the foundation of the future we want. On my side is the entrepreneur Claudio Bier, who is vice president of the Fiergs, chairman of the Agricultural Machinery Association, wanting to unite the great river that he produces with Rio Grande. This is a message of unity, dialogue, convergence. I say: it's a need for change experience, competence to do, and Rio Grande has a solution. I think I have chosen politics as a mission of life, not as a way of life, so that I, when I was able to run for re-election and even with 87% approval in published research by the Diário Popular newspaper in Pelotama, compete. Because I think we need to fulfill our mission in politics, and between our mission is to be able to help shape new leadership, open places for other people who also want and can cooperate a lot. So we chose Paul, the only city that chose the continuity of power in 2016 was Pelotas, with the largest vote in history, our deputy mayor who was elected with 60 percent of the vote. I think there are many priorities that the governor must have, including security, education, and health. And to do that, the first thing we have to do is identify people who can help us. That is why I want to highlight, we have brought with us to help us make a bold public security plan. Delegate Ranolfo, who was the head of the Civil Police, will help us put the order into the country because we will place a warrant at Rio Grande do Sul so that people can live more peacefully. Everyone knows someone who, despite all the difficulties of this economic scenario, dares, undertakes, opens up their new business, faces this burning, difficult time of the economy. Because gauchos are very willing to work. Do not be afraid of services, dare to take and innovate. We must have a government that allows us to do this, because people work, people do it, the government has to let Rio Grande develop, to restore confidence, that's our big goal, Rio Grande do Sul will restore confidence in the future. Our candidacy represents a proposed change for Rio Grande do Sul. Rio Grande do Sul is going through a serious crisis. Brazil is going through a serious crisis, Brazil needs to change. I want Lula to preside over our country once more. And I want to manage Rio Grande from the development, growth and respect of our people. The current government spread the problems of Rio Grande do Sul and ruled in a catastrophic way. PMDB, MDB, PSDB and PP regulate the state of Rio Grande to Sula. That's why these two applications discussed, the Sartori application, the Milk application. They actually represent two faces of the same government. The ruling government, a government that exacerbates the lives of gauchos and gaúcs, has ceased. We want another future for our country, for our country. Management is not easy. Management is difficult. Management requires constant elections. So we did this with Olivia Dutter and Tarsus Genroom. I was Deputy Governor Olivia and I learned to rule in trouble and remove Rio Grande from the crisis. We will re-grow and restore development. Absolute priority in creating work and employment. Support our farmers, workers and entrepreneurs. We will pay the wage on time, as we always did when we managed. We will pay our salaries on time for civil servants, teachers, teachers, police officers and from there to continue the development program for Rio Grande. A good public school for our youth. I want to educate excellence for young Rio Grande do Sul. Security, peace and tranquility for our people. Dialogue of health with our mayors and municipalities and close to our population, with quality. Welcome to our older population well. For a definite fight against violence against women in the state of Rio Grande do Sul, which brings back experiences such as patriot Maria da Penha. I would like to invite you to come with us in the big project of change in the state of Rio Grande do Sul. Developed in Rio Grande do Sul, living in peace. Living in safety. To live in hope. Hurry up with us. Walk with us by changing Brazil and changing Rio Grande. I want to leave a message of optimism for those who listen to us, for all the gauchos. These elections are a unique opportunity for reconstruction, here you have heard several professional politicians who make policy a way of life. It is time to bring the people we admire to what they are doing outside of politics, who have the preparation, who have the experience, leadership, management skills and work better than professional politicians, to propose proper reconstruction in politics. I'm here because I'm optimistic about Rio Grande's future. I want to help build a new Rio Grande. A simpler state, a more just state, with fewer state interventions, encouraging free enterprise. The state is particularly with equal opportunities for everyone, where every gaucho can come in there. Opportunities for those who are involved, for those who work. For everyone who creates wealth in society is an individual with his own initiative, with his work, who is taking, who rises. Who generates wealth is who is committed and who works, is not the government. The government is not a warm transformation of the society, whether it is an individual. The government's role is simply to spend tax on those basic functions, essential functions, giving priority to those most in need. Anyone who was here managed could not have chosen a priority or ironically dominate public finances. That's why we have to rebuild. It's time to choose something really new. The new party is the only news in Brazilian politics, bringing honest people, 100% clean sheet, the only party that has only 100% pure paper. So this is our opportunity for reconstruction, new people in politics, but with experience, with preparation, with the ability to lead it differently. I want to leave a message of optimism. The well-known phrase of Peter Drucker, who died as an American teacher, was one of the gurus of modern management. Peter Ducker said, "If you want something new, you have to stop at the old man." Old politics, in that case. Old professional politicians, old methods and old practices. It is time to choose something really new, new platform, new candidate, but with preparation and experience. Everyone would be aware that I will not answer any questions, we will continue on the same path and the same way. But I just want to refer the reference before solving other issues. It was a fake news that I raised my salary. And abandoning salary increases, it is good to be very clear, so there is no doubt. And I want to say we have three pillars in our vision. First, to abide by the taxation regime because the part we have already done and negotiated, even with the previous government, and not on the current, even when it was Minister of Finance Marcos Barbosa. So, I do not have such a prejudice, and I do not oppose one or the other, you have to do what needs to be done. Second, privatize or federate state-owned companies to concentrate efforts on what is needed: security, education, health, infrastructure and social policy. During the three year period of the debt repayment, renewable for another three, the Rio Grande has to be effective, sustainable and stimulating for development, but optimistic about Rio Grande do Sul, I'm sure we will overcome this crisis. Now we need a lot of unity and a lot of solidarity. it takes everyone to work together. And what we are planning here, I'm sure we are changing the course of Rio Grande to Sula and presenting the opportunity to be in the right direction. I want to quote Vice Cairoli and two Betos, Fogo and Albuquerque as our senators, state and federal deputies. With a lot of pride, I just received a message from a worker saying that I have the best proposals in the PESU to solve the problems of our country and country. It gives me pride because we are a socialist party, workers. We represent and want to represent the vast majority of that country. That is why I am looking for workers, people, poor countries, those who live on the edges of the cities of the capital and the interior who come with us to build up the possibility of rioting in the country, to build a workers' government where they are being elected at their workplace, a teacher, a school official, and the workers in their entirety form this council to govern the state. We want to take those strong measures against capital, because they are in the interest of combating interests that obviously benefit most of the population. That is why we have really noticed that what has been historically implemented is the opposite. Rich have dominated politics, rich rulers of slavery. In fact, the Brazilian bourgeoisie and the parties that present them have the DNA in Brazil in slavery. And we want the opposite, to free the workers from the slavery they are subjected to. And we want to invite everyone to come and build this campaign with us. Because even mainstream media denied today's participation in Bandeirantes this debate.